MUMBAI (AFP) – Israeli leader Benjamin Netanyahu makes an emotional visit this week to a Jewish centre targeted in the 2008 Mumbai attacks, in a trip that India’s tiny and shrinking Jewish community hopes will boost its profile. Netanyahu will talk trade in New Delhi and marvel at the Taj Mahal before rounding off his visit in Mumbai, where the majority of India’s estimated 4,500 Jews live. There he will accompany 11-year-old Moshe Holtzberg as the boy returns for the first time to the house where his parents were killed in the 26/11 terror attacks that left 166 people dead. At Mumbai’s Magen David synagogue, worshippers are excited about the first visit to India by an Israeli leader in almost 15 years. “It’s very good news for us. We’re very lucky to get to see the prime minister over here,” Joel Gershon Awaskar told AFP after concluding his morning prayers. Netanyahu will be only the second Israeli PM to visit India and the first since Ariel Sharon in 2003. It comes six months after Indian leader Narendra Modi toured Israel. For Jonathan Solomon, chairman of the Indian Jewish Federation, the reciprocal visits and warm ties between the two countries are of the “utmost importance” to Jews in India. “The closer the co-operation, the closer the Jewish community in India feels to Israel. So we feel recognised and we feel secure,” he told AFP. It is not just recognition from abroad that many Indian Jews crave. Although historians believe Jews first arrived in India 2,000 years ago, their descendents today say they are virtually unknown in a country where they are hugely outnumbered by Hindus, Muslims, Sikhs, Christians, Buddhists, Jains and Zoroastrians. Nor are Jews officially recognised as a minority community by India’s government. India is in fact home to several distinct Jewish groups. These include Bene Israelis, who have the longest history in India, and Baghdadi Jews, who fled persecution in the Middle East in the 18th and 19th centuries. Although there are no official figures, academics say India’s Jewish population peaked at around 20,000 in the mid 1940s. Numbers have dwindled rapidly because of emigration since the creation of Israel in 1948. “Many people here don’t know about the Jewish community, about our customs and festivals,” said Awaskar, who hopes Netanyahu’s visit will help increase awareness amongst Indians about the Jewish faith. 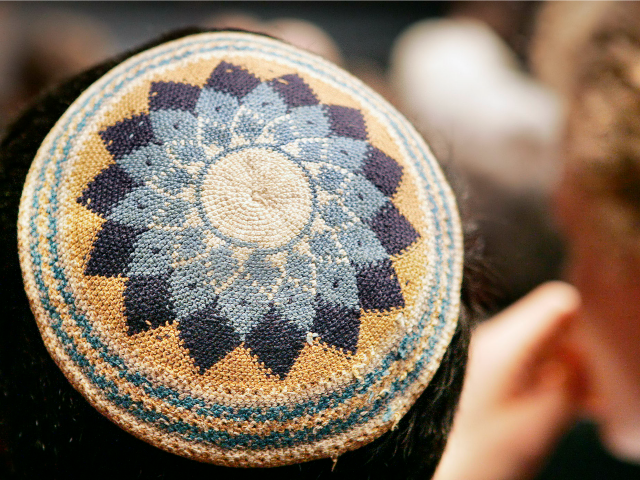 “It will be good for us, we’ll become well known,” he added, a black-and-white checked, round cloth “kippah” resting on the top of his head. Magen David, light blue in colour and situated in Mumbai’s historic Byculla district, is one of eight synagogues in India’s financial capital and surrounding suburbs. Every morning some 15 men — a few swaying back and forth — recite prayers there, in a space which could easily hold hundreds. Afterwards they sit down for a breakfast consisting of bread, eggs and cheese, washed down with a cup of milky Indian tea. More prayers are read and then bananas and slices of apple are served. India’s Jewish community hasn’t experienced the discrimination seen in other countries, a fact that Jewish historian Leora Pezarkar partly attributes to its adoption of Indian customs, dress and language. “The community has mixed really well with the local population while not deviating from who they are as Jews,” she told AFP. David, whose parents fled persecution in Iraq to come to India 125 years ago, says he has never experienced or heard of anyone being a victim of anti-semitism in India. “There was just one attack and that took place from outside the country, not internal, at all,” he told AFP, referring to November 2008. Six people were killed at Chabad House, a Jewish centre in south Mumbai, when Pakistani militants carried out co-ordinated attacks across the city. Moshe Holtzberg was just two years old when his parents, who ran the centre, were gunned down. He was saved by his nanny who managed to escape and now lives in Israel. On Thursday, Moshe, along with Netanyahu, will visit his former home where a memorial to the victims is to be unveiled. “His visit is going to be very emotional for us. This is the place where he got his last hug from his father and mother,” Israel Kozlovsky, the centre’s rabbi, told AFP. Netanyahu will also travel to Modi’s home state of Gujarat and host a party for Bollywood producers where he will trumpet Israel as a filming location. Jewish leaders hope the visit will help persuade India’s government to officially recognise them as a minority community, meaning they would be included in the census. In 2016, Maharashtra state granted Jews minority status, making it easier to register marriages and acquire funding for institutions, but the central government is yet to follow suit. “Although it is just a symbolic recognition it is important for the community,” said Solomon.